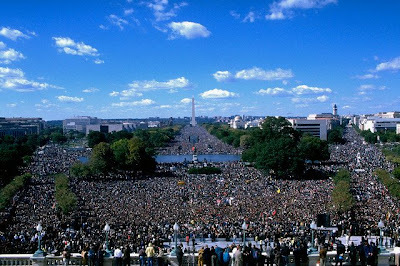 At the end of the Million Man March, the Minister asked all of those men to make a pledge and I stood to make that pledge along with them via television. I then went home that night and re-watch the event on my recorded tape which I still have now in my home. 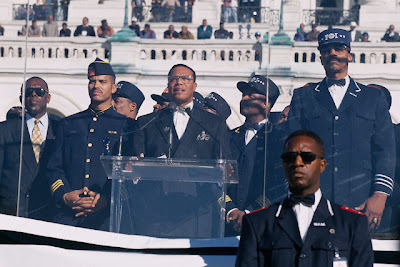 And now, 14 years later we have come to a critical point wherein Minister Farrakhan is set to deliver a critical message on October 18, 2009 in commemoration of the 14th Anniversary of the Million Man March in Memphis, Tennessee. Minister Farrakhan is quoted in a recent Final Call article by Ashahed Muhammad stating that, “We hope to gather many, many people from Mississippi, Arkansas, Alabama, Georgia, and the Deep South to come up to Memphis. We need land. Since America is being bought up by forces outside, we need to pool our dollars to buy huge tracks of land that we can begin to build an economy for ourselves. We need to think about how to fulfill the prophecy (Isaiah 61:4) where it says, ‘And they will rebuild the wasted cities.' We need to be prepared to build our communities." As someone who was in the crowd, the spirit was beyond words for me. There were men as far as one could see in any direction. It was peace and calm. Brothers wanted to shake your hand, take your picture. They wanted to know where you were from and hug you. Older men were shedding tears of joy for the moment in time. It is something I WILL NEVER forget. WOW! I was much older than you brother Jesse. I can remember the butterflies in my stomach as we rode the train in and once we got off the train my walk brought back memories of coming out of the tunnel for a Friday night football game. I was a participant and a spectator in one of the defining moments in history. I knew I had no other choice but to drink in this moment because I could share with friends and families for years to come my experience. 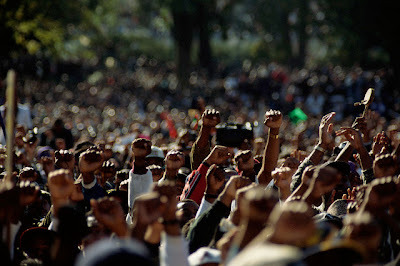 The picture of the brothers with collectivley raised fist brought back all of the emotions. I remember coming upon an exchange between an older minister and a young brother from the NOI and they looked at each other and embraced and the energy transfered was felt within me. I had my camera readey to take pictures but at that moment I lost all focus of this shot. Needless to say that image will forever be etched in my mind!